The Siam Country Club Pattaya, Old Course is conveniently located on the east side of Sukhumvit Road, opposite Pattaya Beach, Chonburi. Just 15 minutes away from Pattaya, the 800 rai (about 32 acres) picturesque golf course was founded by Dr. Thaworn Phornprapha back in 1 March 1971. The golf course and clubhouse then went through a facelift and officially reopened in 14 May 2007. The golf course maintained the same layout but it went through a major revamp from tee to green with a wall to wall cart path. The renovation works brought Siam Country Club to a truly international championship standard, making them one of the best golf courses in Thailand. The clubhouse was also upgraded to a modern and relaxing ambience, overlooking the 18th green. To commemorate the remarkable milestone, the Siam Country Club changed their name to the Siam Country Club Pattaya, Old Course. The elevated tees provide breathtaking views of this magnificent starting hole. Bunkers on the right side of the first landing area must be avoided all costs from the tee. A small pot bunker fifty yards short of the green will force players to decide on their desired approach to the elevated green. This is a relatively easy starting hole with conservative play. Bunkers located both short and long of main landing area offer several options on playing this hole. 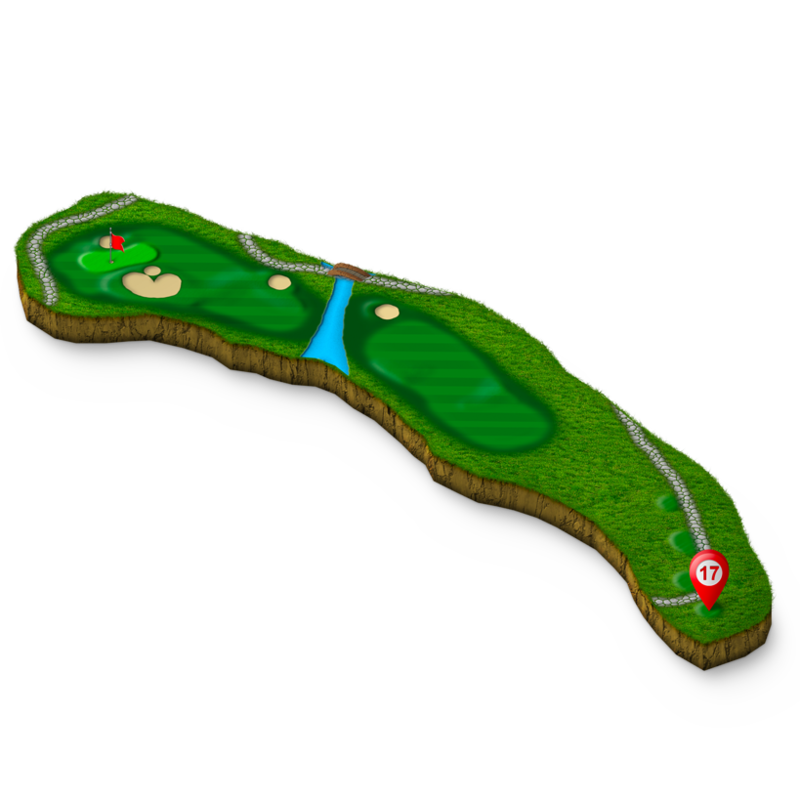 The green is defended by one small bunker on the right front, but the grass hollows surrounding the raised green will test the recovery shots of the players. Subtle undulations in the green also add to the challenge of playing this hole. Length on the tee shot is a prerequisite on this uphill hole. The landing area is very narrow with bunkers and mature trees lining both sides of the fairway. 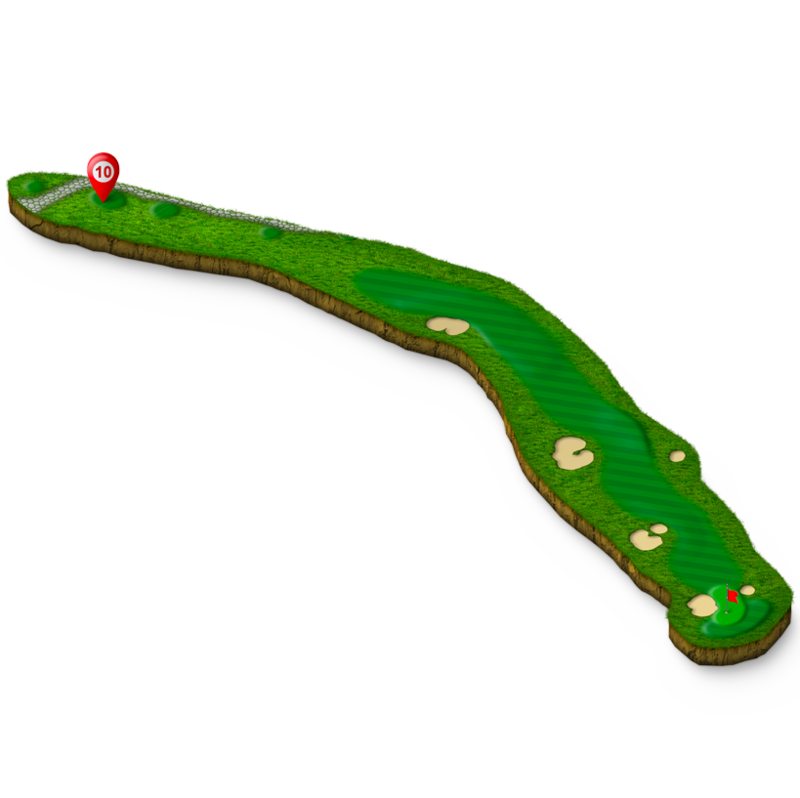 The green is very slender in shape with very treacherous pin positions. Club selection will be very difficult with the downhill elevation change and the periodic strong breeze from the ocean. The large bunker on the left guards one side of the green with a small bunker and a tightly mowed bailout area to the right gathering in all errant shots to the right. 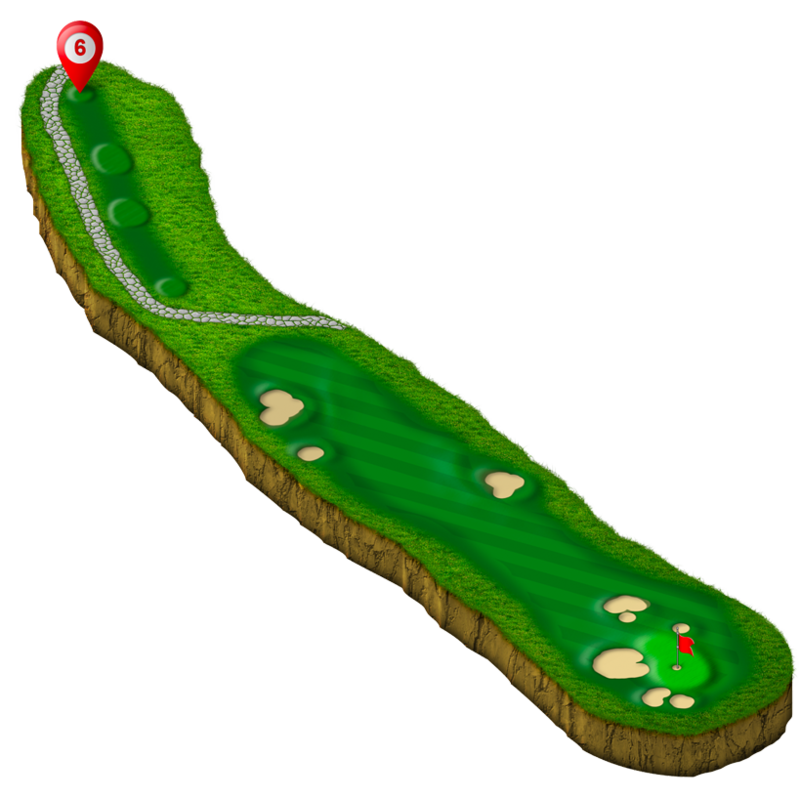 Similar to Hole 4, the downhill elevation change and periodic strong breeze will affect play. 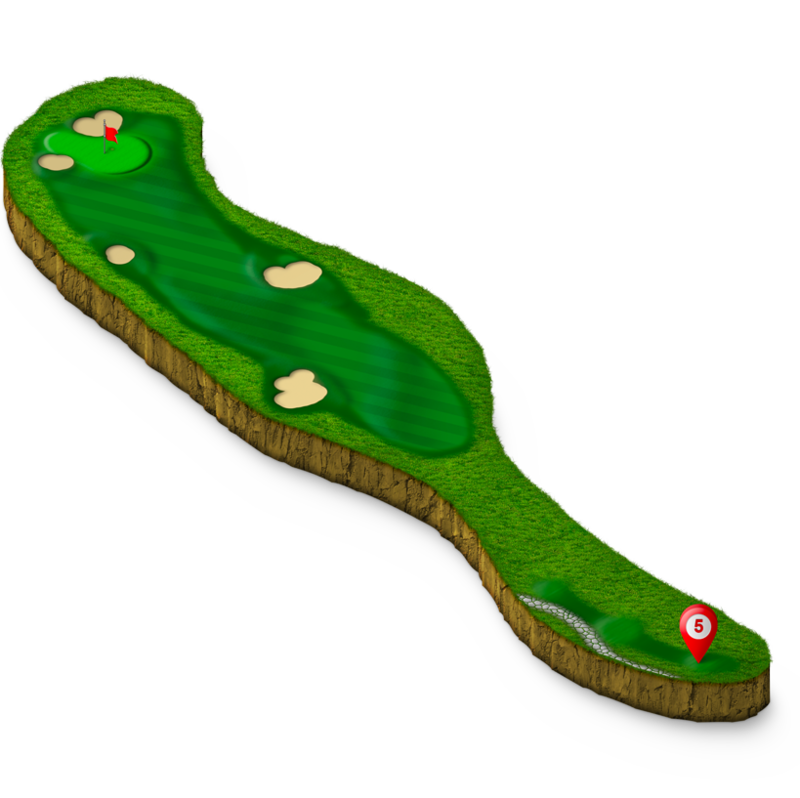 The larger green will also provide many interesting putts to score par or better. 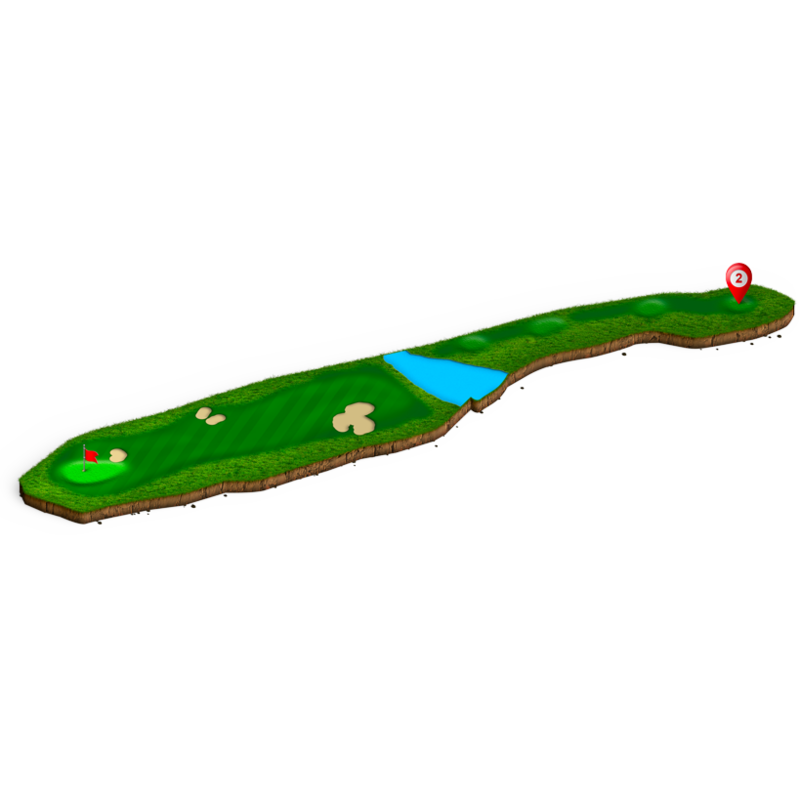 The uphill elevation from tee to green will make this hole play twenty yards longer than the yardage shown on the scorecard. The main hazards are located around the green where the bunkers protect three sides and a low cut collection area behind the lift greenside bunker. 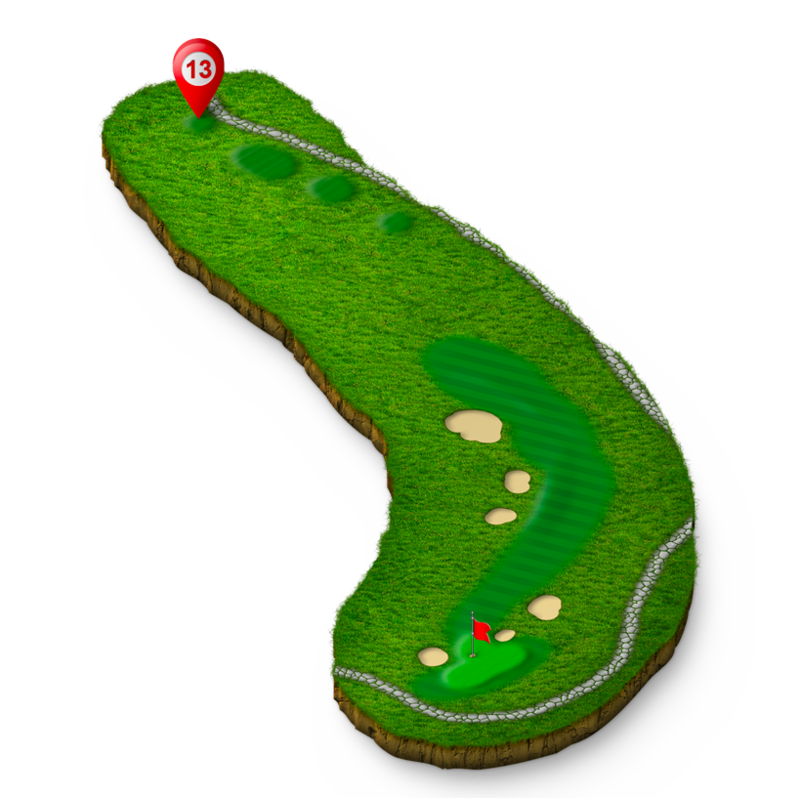 It will be very difficult to judge the accurate distance from the landing area to the raised green with the elevation difference and the long and narrow green The accuracy of the approach shot to the green will often determine if a score of par or better can be earned. 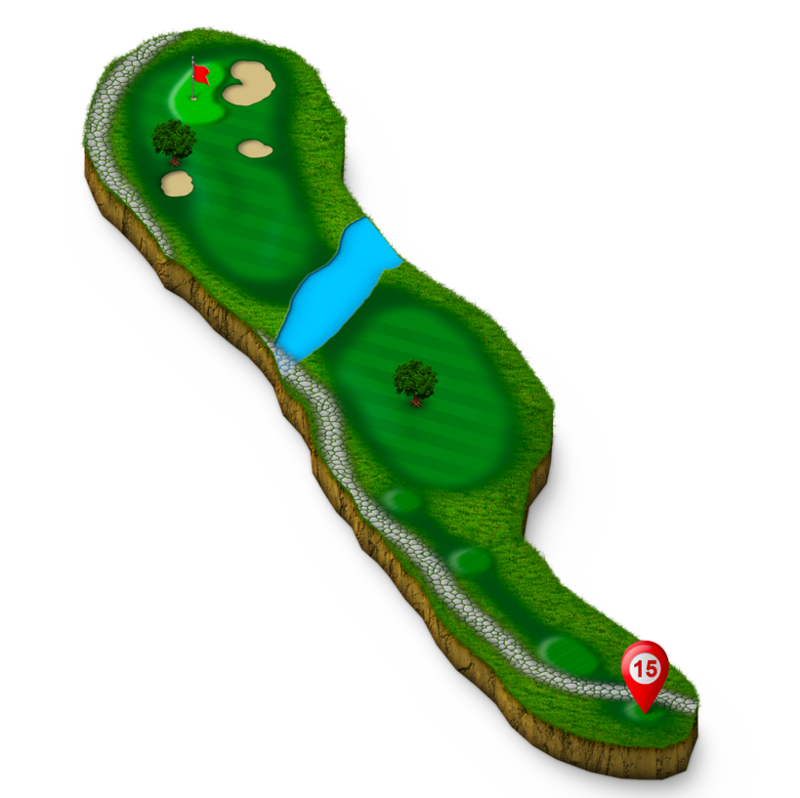 This short par five begins from the elevated tee and gradually bends from left to right as the hole plays downhill. Three majestic trees located in the fairway on the right must be avoided to have any chance of reaching the green in two. A large bunker one hundred yards from the green on the right defends the shortest route of play with the safer second shot being to the left and then having a short pitch to the tiered green. The beautiful lake on this long par three adds to the intimidation factor. Two large bunkers are located to the right and back of the green with two smaller bunkers and a tightly mowed recovery area positioned to the left of the green. 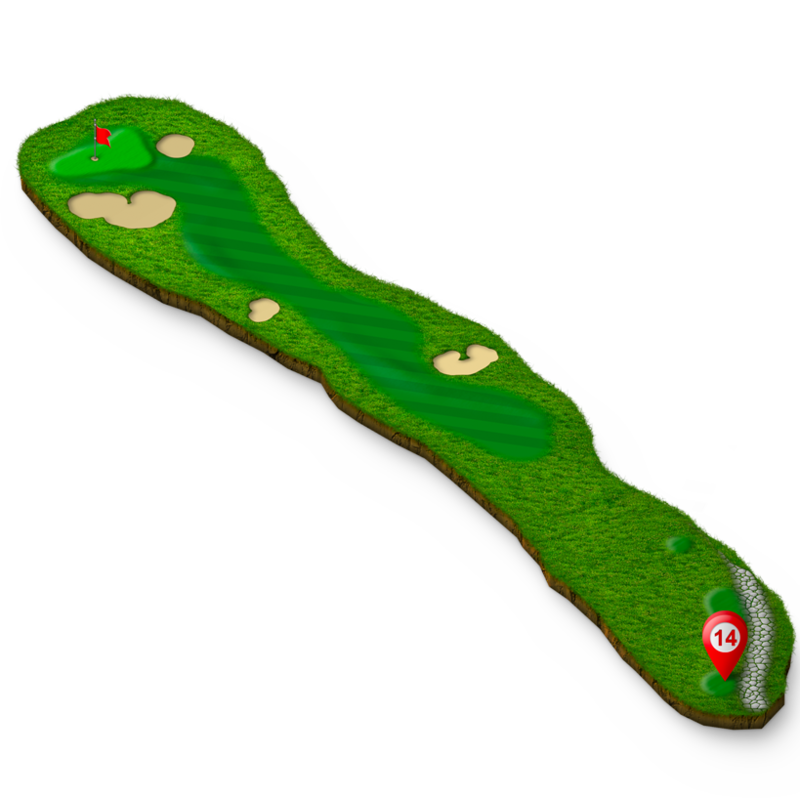 The ability to get up and down from the areas around the green will often determine the score on this exciting hole. The beautiful lake on this long par three only adds to the intimidation factor and should not come into play. Two large bunkers are located to the right and back of the green with two smaller bunkers and a tightly mowed recovery area positioned to the left of the green. Being able to get up and down from the areas around the green will often determine the score on this exciting hole. The view from the tee is framed by the beautiful Buddha statue atop the hillside beyond the green. A sculptured bunker complex on the left of the fairway must be avoided at all costs. 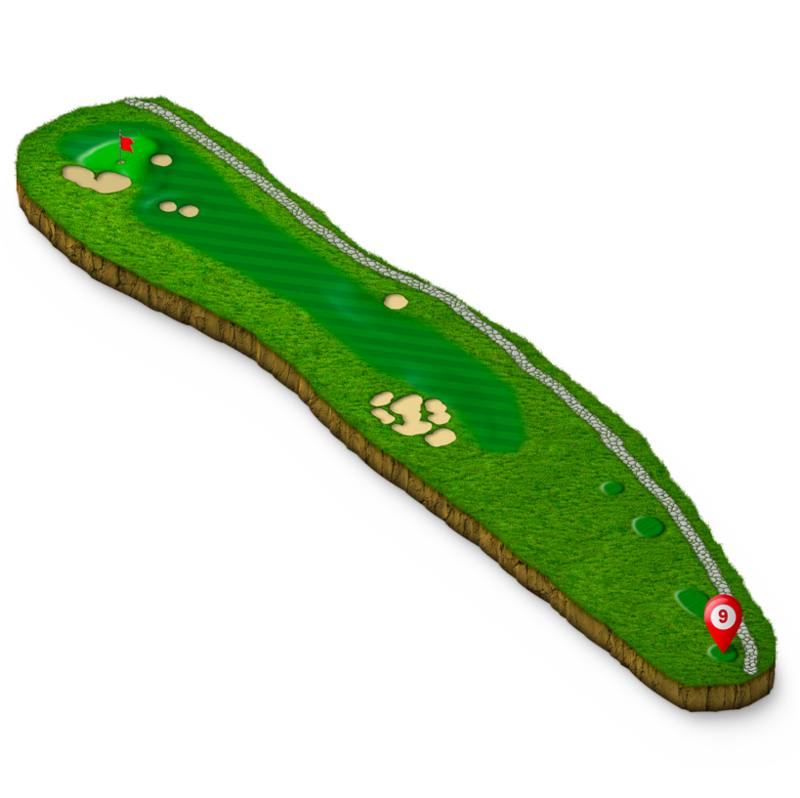 The green has three distinct elevations with a large valley running through the middle of the green which will create many key putts that could save par. 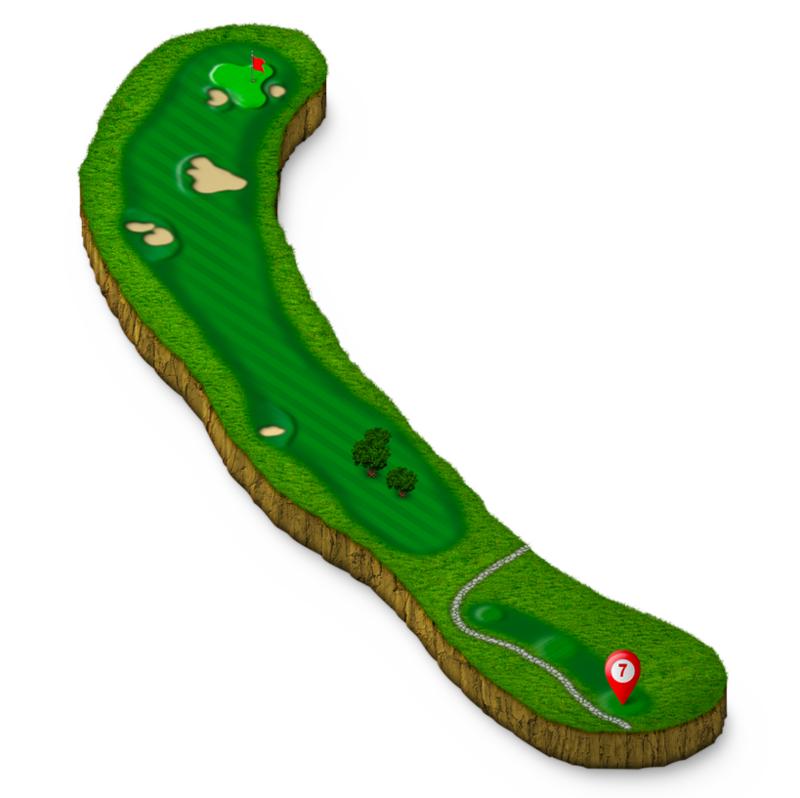 The back nine begins from the elevated tee with the hole gradually turning to the right and descending over twenty meters downhill to the green. The second landing area is well protected with bunkers both right and left requiring players to choose their desired route of play. The back right portion on the green is the most difficult being lower than the front of the green and being surrounded by tightly mowed areas off the green. The tee shot plays over a beautiful lake to a well bunkered landing area where there is very little room for error. The two small bunkers at the green guard both the front left pin position and the back tight creating exciting pin positions on the undulating putting surface. Both the tee shot and the second shot to the green must be well played for any chance of scoring par or better. This mid length par three plays slightly uphill to green with the major hazard on the left front. 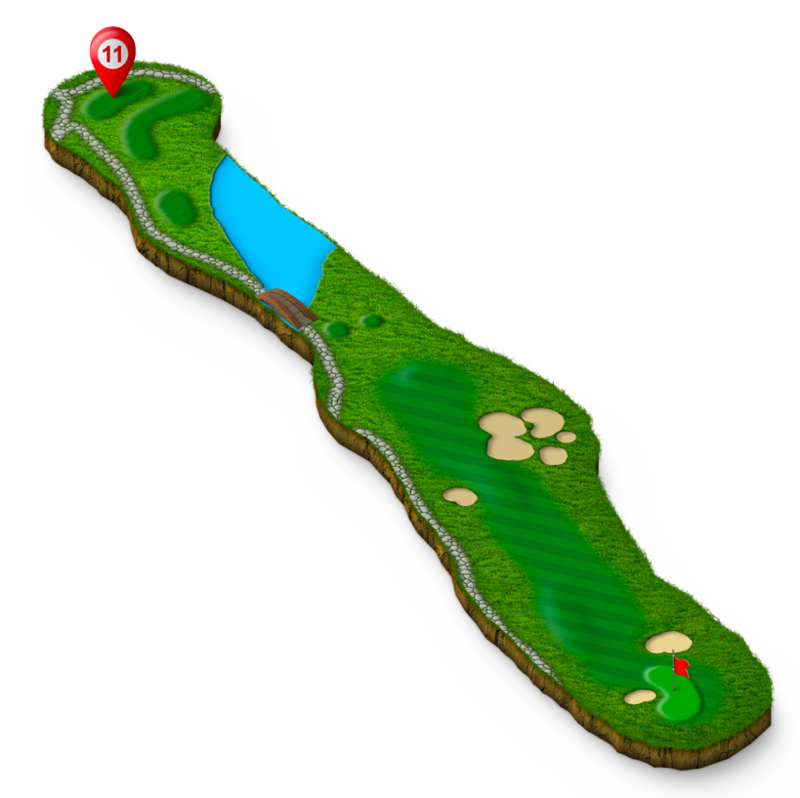 The green is large, but there are many subtle contours within the green that will test the players to attain par. Proper club selection and a well executed tee shot are crucial in order to score well on this hole. Bunkers protect the shortest route of play down the right side of this short par four. With the uphill elevation change from tee to green, the additional club needed for the extra length should be taken into consideration. 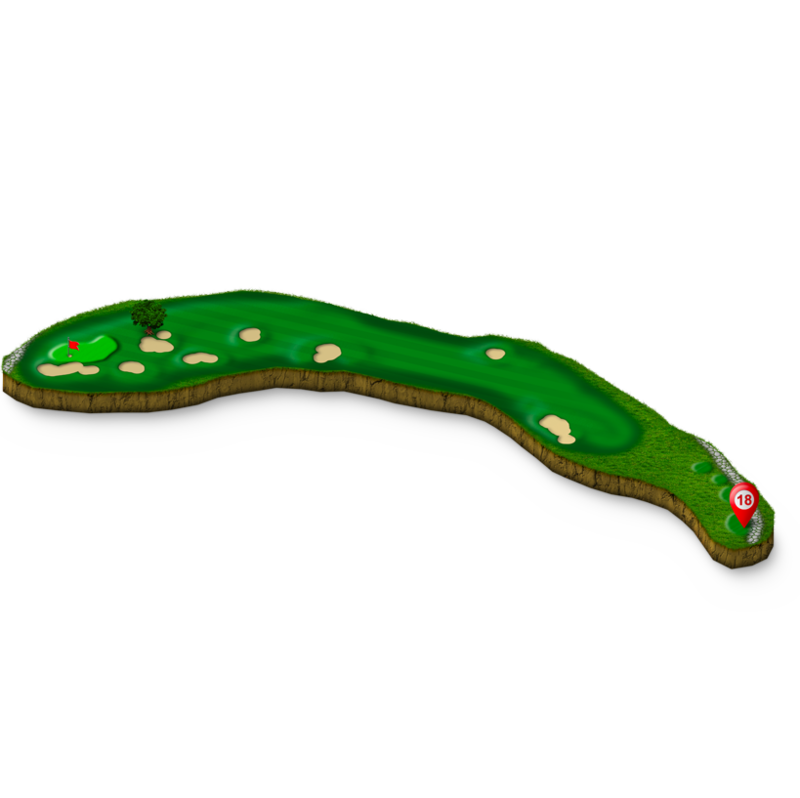 The green will allow for many makeable putts to obtain par or birdie. Diagonal bunkers in the landing create varied options for the desired route of play from the tee. 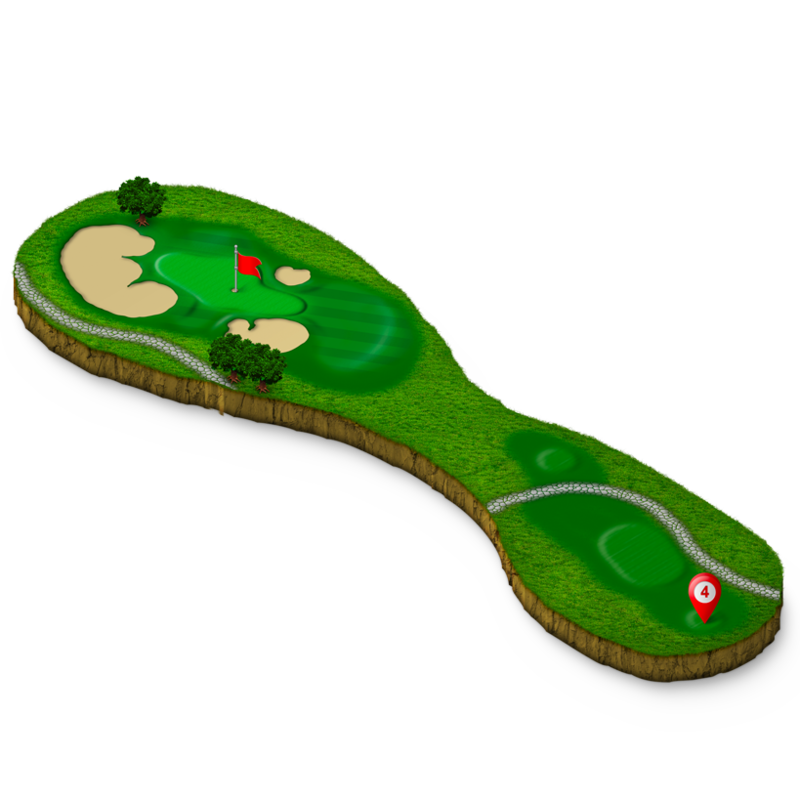 The downhill design of the hole will add extra length on all tee shot and will usually leave only a short iron to the green. The large bunger on the left appears to be close to the green but is actually twenty yards off the green. Avoid this bunker at all cost. A three wood or utility club may be the better play from the tee. 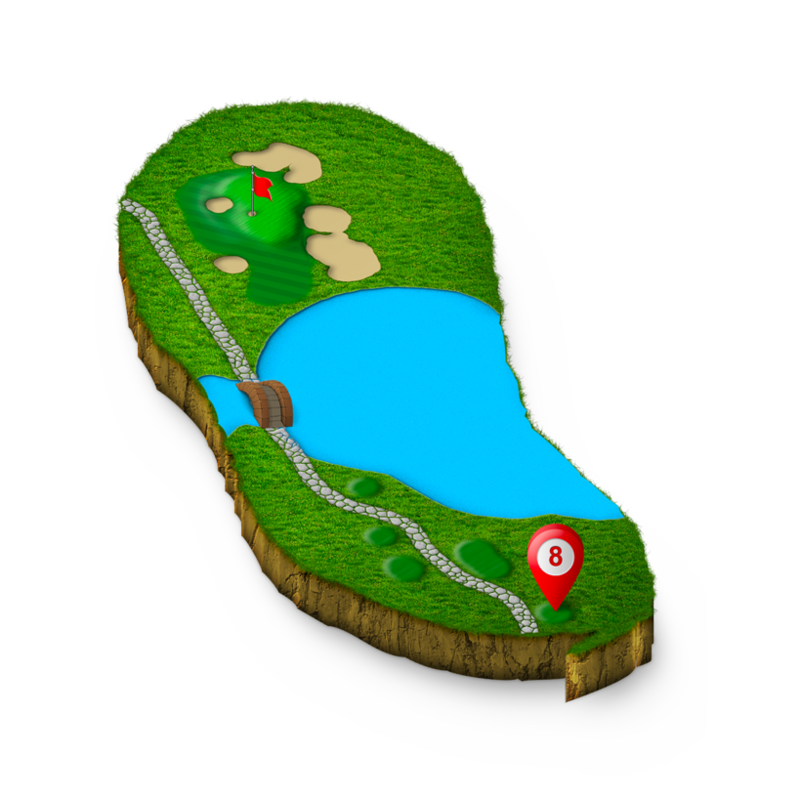 A klong traverses at the main landing area forcing all players to make a decision whether to try and carry the hazard or play short and safe from the tee. A large tree creates another hazard to the right in the short landing area. The green is framed with majestic mature trees that add to the beauty of this challenging yet exciting hole. 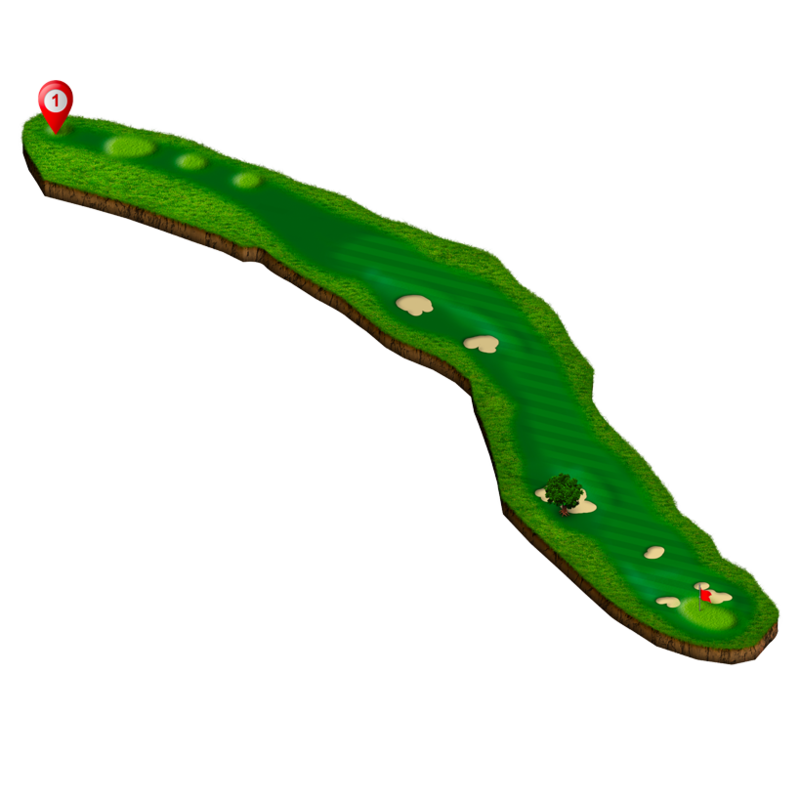 The longest of par threes will play very difficult from the back tees. The water near the tees does not come into play, but adds both beauty and serenity to this exciting hole. 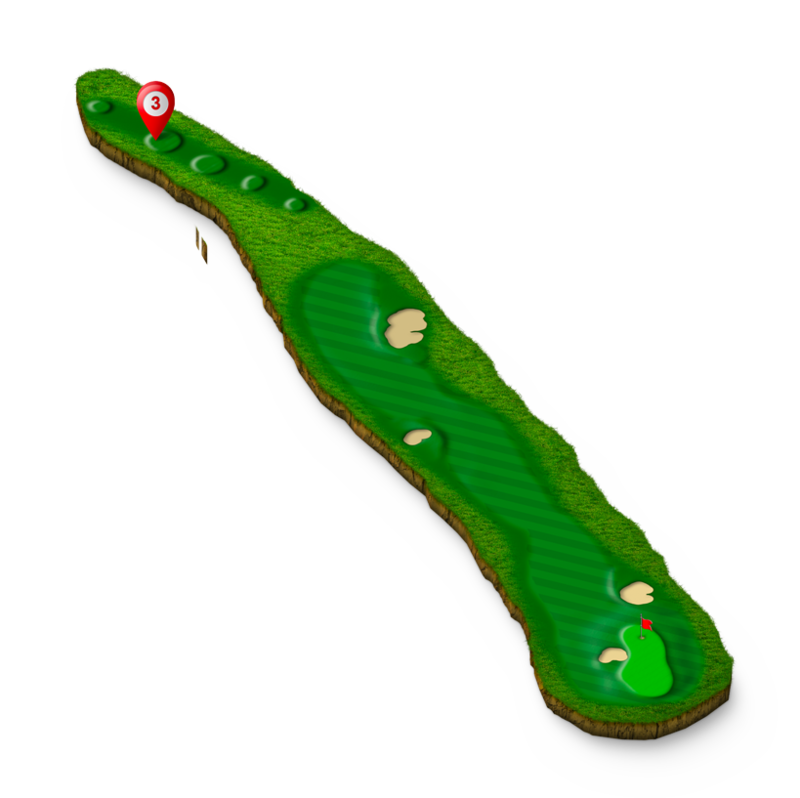 Playing from the low mowed areas around the green will be challenging as the recovery shots will be difficult. This great hole could potentially determine the winner of the tournament. 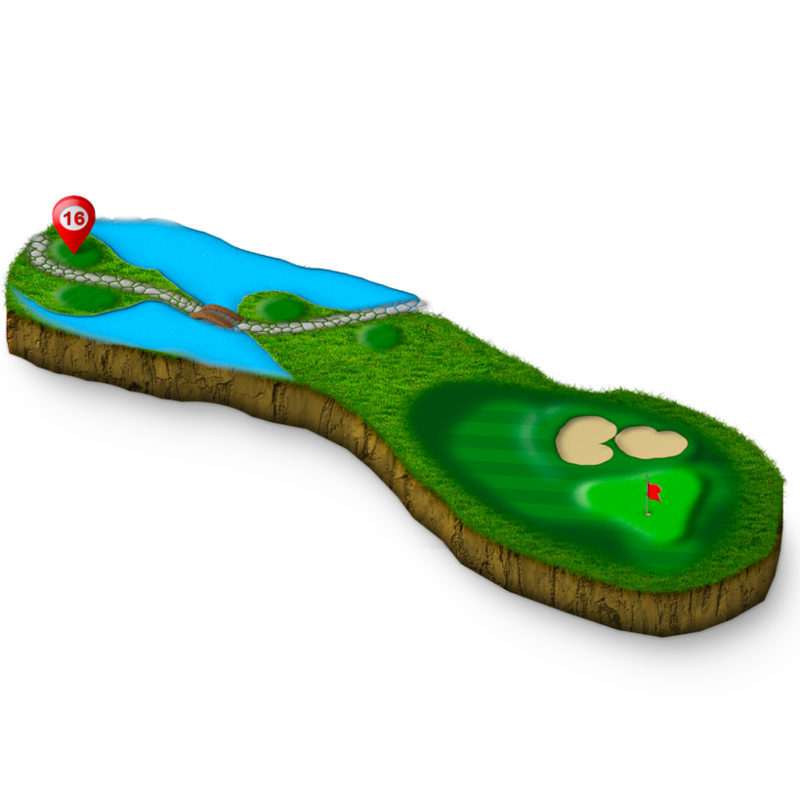 Decisions will again have to be made by the golfer at the tee on their desired strategy in playing this hole. The klong crosses at the main landing area forcing most plays to play short of the hazard. 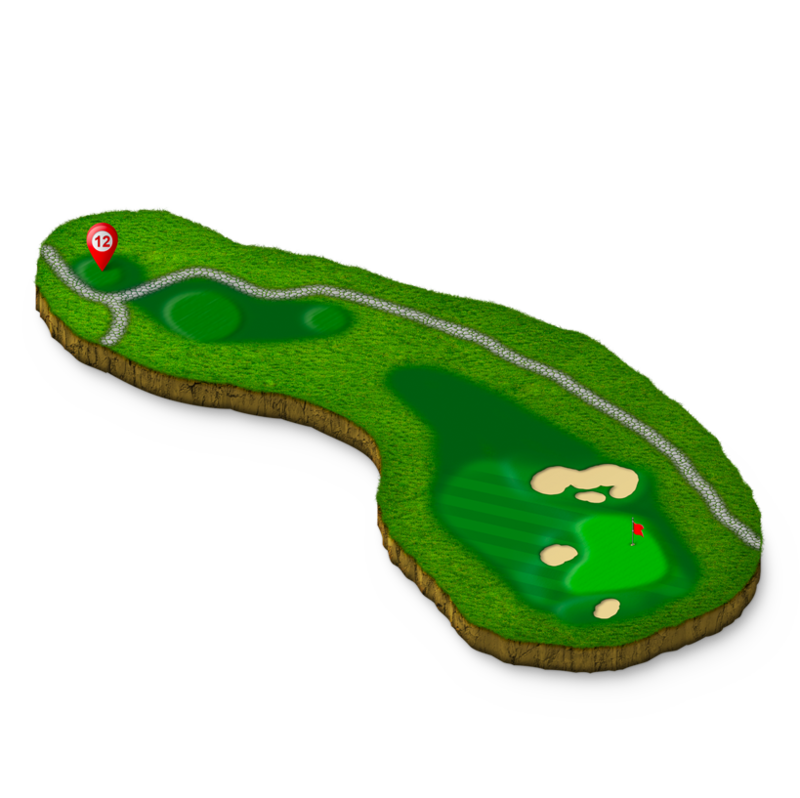 The green is angled right to left with the most difficult pin locations being in the back left of the green. Getting up and down from the bunkers around the green will be a test of skills. This short par five will play much longer with the elevation uphill from tee to green. Bunkers located near the second landing area and around the green will add to the excitement and enjoyment in playing and watching the finishing of the 18-holes. The green has a lot of elevation change in the putting surface and will require both experience and skill for proper execution.